Librarians, museum curators, second-hand book dealers and impoverished students studying in the US all owe Dr Supap Kirtsaeng a very large drink! Had the case brought against him by publishers Wiley gone the other way, the consequences for world trade and culture could have been drastic. On 19 March 2013 a majority of the US Supreme Court finally gave victory to Dr Kirtsaeng in a legal battle which had begun in 2008 and which turned on an apparently obscure point of copyright law, the doctrine of "first sale". The publishers sued him for copyright infringement, although the works had been legally published by Wiley's subsidiary Wiley Asia and legally purchased in Thailand. They relied on the statutory right of the copyright owner to dictate when, where, how and at what price a copyright work can be lawfully placed on the market ("the right of first sale"). Kirtsaeng countered that the works in question were being sold for the second time; the first sale had been when they'd been lawfully put on the market in Thailand and bought by his family. As a result, the right of first sale had already been "exhausted" at the time when the copies arrived in the US and the publisher could not prevent their resale. As the case went against Kirtsaeng, first before a jury and then on appeal, the wider implications of Wiley's argument started to alarm observers. Were they really seeking to control what people did with property they had lawfully purchased? What about other rights of copyright owners? Would libraries have to go through their entire holdings and obtain relevant permissions before they could lawfully lend foreign editions of works? What about museums and art galleries borrowing exhibits from overseas collections? Would bookshops from St Petersburg to Timbuktu be required to advise American customers that they might find themselves in breach of US law simply by buying a few rare editions? What about items like consumer electronics - could visitors to the US find themselves having their iPads (manufactured in China, legally purchased in Manchester) confiscated as contraband by US Customs? So, for the time being 2 copyright cannot be used to prevent resale in the US of books brought abroad. The case highlights the growing division between the treatment of hard copy books and e-books. The transfer of e-books between users is restricted - legally, and often physically by the use of DRM technology - because under copyright law an e-book is not generally "sold" to the user, but "licensed". The basis for this is a quirk of technology; in order to read a work in electronic form a number of copies have to be made of it. First, the original download to the user machine. Then, various transient copies as the file is loaded into an e-book reader. Any copying of the e-book into different storage areas of the machine entails creating another copy. Since copying - however transiently - is a primary act of copyright infringement unless the copyright owner consents, this is used to restrict further dealing in digital works by people who have acquired them. It can prevent them selling them secondhand, lending them to friends, giving them as gifts and even leaving them to their children on death. The percentage of the consumer spend on books and music represented by digital downloads is steadily increasing. However, the market is potentially being strangled by rights holders taking a narrow view on what the rights of the user should be, just as the publishers fought Dr Kirtsaeng in order to preserve their lucrative division of overseas markets. Some sensible thinking needs to be done about how to avoid copyright anomalies and preserve a sensible balance between the rights of copyright owners and users in a global and digital marketplace. Dr Kirtsaeng's maths textbooks mark an important milestone on the route to that postion. 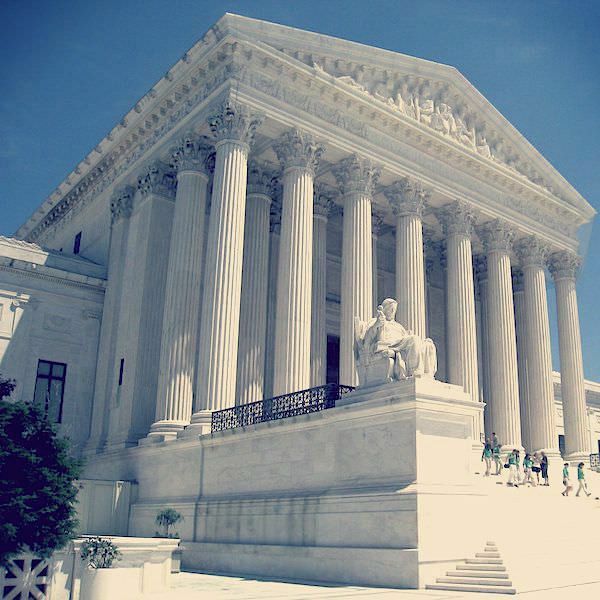 The main image used for this article is: 'US Supreme Court, oblique facade' and was used under the terms detailed at the above link on the date this article was first published.